If you’re unsure about replacing procedure, have it done by an authorized Kia dealer. 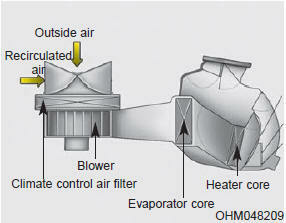 Replace the filter according to the Maintenance Schedule. If the vehicle is being driven in severe conditions such as dusty or rough roads, more frequent air conditioner filter inspections and changes are required.